With every end comes a new beginning… Join your favourite students from the School for Good and Evil in the exhilarating fourth book in this bestselling series. 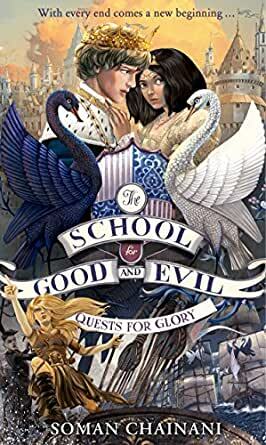 Before they can graduate, the students of the School for Good and Evil must complete their fourth-year Quests for Glory. The stakes are high: success brings eternal adoration, and failure means obscurity forever. For their quests, Agatha and Tedros are trying to return Camelot to its former splendour as queen and king. For her quest, Sophie seeks to mould Evil in her own image as Dean. But they soon grow isolated and alone, and all of the students' quests seem to plunge into chaos. Amidst obstacles both dangerous and unpredictable, who will rise and lead the charge to save them . . . ? this is one of the tipe of books you cant put down. 5.0 out of 5 starsMy Daughter Loves it! She loves these books, and delivery was fast!